Perfectly located in the heart of the Parramatta's business & shopping district, Fiori Apartments are ideal for business travellers or executives needing relocation accommodation. This Serviced Apartment complex offers a choice of fully furnished studio, one and two bedroom apartments with balconies. Featuring contemporary finishes, fittings and brilliant light-filled interiors, all apartments feature a fully equipped kitchen fitted with quality Smeg dishwasher & appliances, fully equipped internal laundry with dryer and washing machine, individually controlled air-conditioning, Broadband internet, beautiful, quality bathroom/s with shower over the bath, private balcony, hairdryer, flat screen TV, cable TV,DVD & CD player, radio/alarm clock and built-in wardrobes. 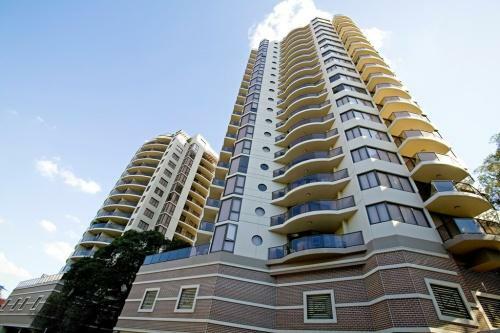 The Fiori Apartments is close to everything that Sydney has to offer and features numerous guests facilities including guest laundry, gym & fitness equipment, lift, sauna, spa, bbq, indoor pool and 24 hour reception. The Fiori Apartments, Parramatta offer resort style facilities an indoor heated swimming pool, gymnasium, spa, sauna, undercover golf facility (artificial putting green), barbecue facilities, onsite convenience store, lift/elevator, on site management, after hours on site security team,laundry/dry cleaning service and secure undercover car parking. The Fiori Apartments offer the discerning business/corporate or leisure guest an ultra convenient location, just a breath away from the CBD, railway station(3 minute walk), bus interchange, Westfield Shopping centre, Chinatown, restaurants, cafes, schools and parks. Nearby Attractions : Enjoy all the facilities that Parramatta and the surrounding area has to offer such as explore Sydney Harbour and Parramatta River by Rivercat Ferry, Visit the Riverside Theatre, Shop at Sydney's famous Direct Factory Outlets (DFO) at Homebush, Checkout the largest Westfield in Australia or grab a bargain at paddy's Flemington markets which is only miniutes away from Rosehill Gardens Racecourse. 1 Bedroom Queen Apartment : Sleeps up to 3 guests on 1 Queen & Rollaway Or Sofa Bed Extra. 2 Bedroom 2 Bathroom Apartment : Sleeps up to 5 guests on 1 Queen & 2 Singles & Rollaway Or Sofa Bed Extra.